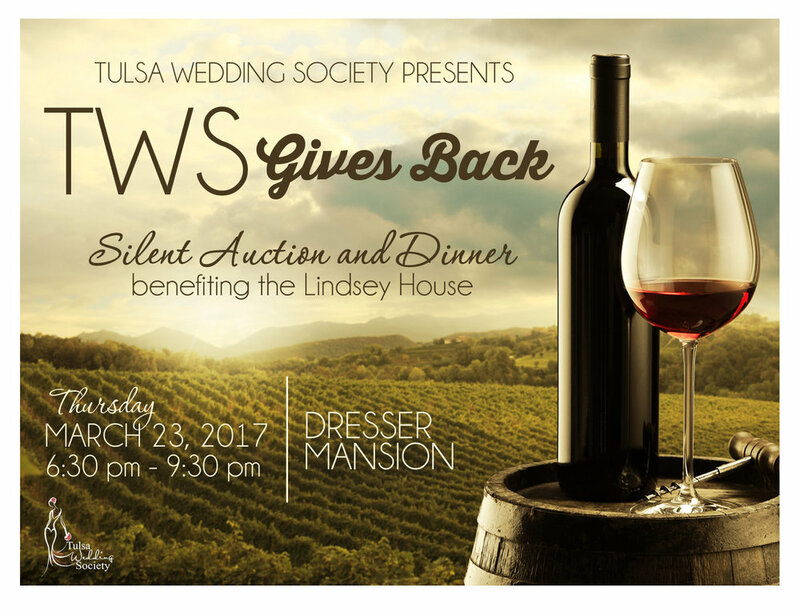 TWS Gives Back is an annual event hosted by The Tulsa Wedding Society benefitting a local charity. If you are an engaged couple or know one, this event is for you. You can bid on wedding services from amazing wedding professionals and since all of the proceeds go to a charity, what you purchase is tax deductible. This year, TWS is giving 100% of the proceeds from the silent auction to the Lindsey House based out of Tulsa. The Lindsey House provides long-term shelter and supportive services to women caring for children. Their mission is to support these families as they transition from homelessness, learn important life skills, and regain the confidence to become self-sufficient. The charity began as a group of church goers saw a need for single mothers without substance abuse or domestic violence. Women can stay up to 18 months learning the life skills necessary to live on their own. They have to pay off their debt with their own money, learn to live with no credit, and have to save money as part of a financial iteracy plan. So far, the Lindsey House has helped pay off $43,000 in debt. The Lindsey House currently has 12 units and is raising $6 million to build a new building. This is a charity that truly gives back to our local community. The silent auction and dinner begin at 6:30 at Dresser Mansion on Thursday, March 23, 2017. Click here for a full list of silent auction items and to buy tickets. Single tickets are $25 and VIP Couple tickets (including reserved seating, wine, and swag bag) are $65.